1. Mix all the wonton ingredients in a bowl. 2. Add 1 or 2 tsp of the mixture in the center of a wrapper and fold to make a triangle. Seal the edges using little water. 3. Repeat until all fillings are used. 4. Keep aside in a fridge until required. 5. To make the soup, add all the ingredients into a pot. 6. Bring to a boil and then simmer for 30 minutes. 7. Strain and discard the solids. 8. Bring to a boil again and add the wontons. 9. Cook for 3 to 5 minutes or until the wontons float to the top. 10. Divide the noodles among serving bowls. 11. Add the soup and wontons. 12. Garnish with ginger slices and spring onions. 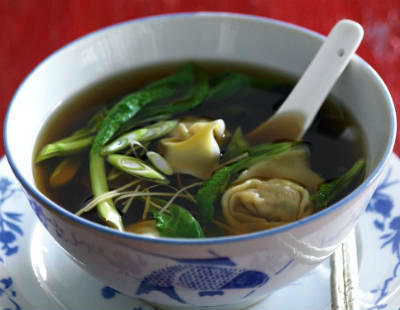 Feel free to comment or share your thoughts on this Chicken and Prawn Wonton Noodle Soup Recipe from Awesome Cuisine.